This is a book about a scientific discovery. Having spent my life as a professional scientist, I have written it up just as I would have recorded any other discovery. The training of a scientist sets limitations by which the average story writer is usually not bound. Above all, the scientist has to guard against the ever present danger of approaching his subjects with preconceived theories which he then sets out to prove as being correct. Fortunately, this danger did not exist in the present case, simply because I had no theories on the subject at all. Not having any theories was not too difficult either since I did not even know the subject well enough at that time. As so often happens in scientific enquiry it all began with a chance observation which, while interesting and stimulating in itself, did not appear to be of more than limited importance. Although I was fully aware of the great riddle presented by the pyramids, namely the question why this immense effort had been made 5,000 years ago, I was not at that stage aware that my chance observation might provide the key to it; neither did it enter my mind that I might possibly contribute to its solution. However, a scientific discovery is usually not, as so many people imagine, a sudden flash of intuition by which the whole truth is revealed in one glorious instant. In ninety-nine out of a hundred cases it is a slow, and often laborious, process - very much like a detective story in which the clues have to be patiently assembled, and many false leads have to be eliminated. Just as is the case with a detective story, the process by which the scientist obtains his final result is as intriguing to him as the result itself. Certainly, the result must remain the ultimate aim but much of the satisfaction with the achievement is vested in the way that led to it. It is for this reason that in my account of the pyramid problem I have essentially adhered to the chronological order of the various stages which ultimately led to the solution. It was a task which to me, as a scientist, was superbly exciting, and it is the joy of this excitement, more than anything else, which I should like the reader to share with me. There is another reason for recording the events in their chronological sequence. However sure the scientist may feel that he has not slipped up somewhere in his arguments and conclusions, nobody would be so conceited as to believe that his deductions are infallible. It is therefore essential that he should present a full account of his work so that it can be checked at every stage. The thesis put forward in this book is an extremely simple one. The pyramids of Egypt are immensely large, immensely ancient and, by general consensus, extremely useless. These fantastic man- made mountains, containing altogether more than 25 million tons of quarried limestone, and with very little space inside them, were heaped up in little more than a century. Nevertheless, however useless they appear to us, they must have been considered as extremely useful by the ancient Egyptians since they expended an almost unbelievable amount of labour in constructing them. In the course of history attempts have been made to explain the function of the pyramids as astronomical observatories, as granaries, as refuges from the Flood, as repositories of divinely inspired prophecies, or even as the work of visitors from another planet. 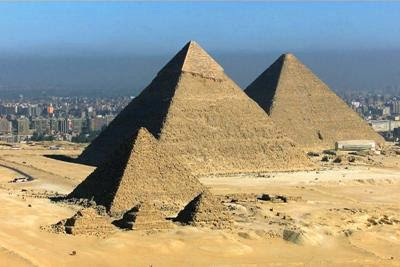 Archaeological evidence, however, leaves no doubt that the pyramids served as funerary monuments for the early pharaohs. Whether they were the actual burial places, as most people believe, or whether they are merely cenotaphs, will be discussed later. It is, in any case, a matter of only secondary importance to our own considerations. The fact remains that all archaeological and literary finds attest to the existence of funeral rites and of a large body of mortuary priests in connection with the pyramids. On the basis of this inescapable conclusion it had to be assumed that this early civilisation had mobilised all its resources and directed its entire labour force to produce nothing better than a gigantic royal tomb. This assumption is made even more difficult by the fact that the era of large pyramids was relatively short and that, for centuries before and after, pharaohs were buried less ostentatiously, and certainly much more cheaply. It is our thesis that the generally accepted conclusion that the large pyramids are nothing more than royal tombs may be based on a subtle logical error. While it is readily admitted that the pyramids served as royal mausolea, it does not necessarily mean that this was the only purpose of their construction. In fact, it probably was not even the main purpose. The discovery of this main purpose is the story told in this book. No discovery ever stands on its own; it is always based on an existing body of accumulated knowledge into which it has to fit and to which it has to make an original contribution. In our case the body of existing knowledge is the field of Egyptology. For over a century professional Egyptologists have excavated the tombs and temples of Egypt, deciphered and translated the inscriptions on the walls and in the papyri, correlated archaeological and scriptural evidence, and in this way built up a remarkably consistent picture of a civilisation that died thousands of years ago. Their painstaking research and their conclusions by now fill about 20,000 volumes of books and bound periodicals. Thanks to this massive treasure house of information I have been able to study the background to my own work on the pyramids. Without this immense volume of fact, collected by Egyptologists, my own observations would have neither purpose nor meaning. When setting out on this work I was delighted to discover that, with one somewhat bizarre exception, Egyptologists did not resent the intrusion of a stranger in their midst. Quite on the contrary, they were invariably most helpful, patiently explaining to me the relevant features of their work and guiding me through the maze of Egyptological publications. Their attitude, that of true and devoted scholars, has been to welcome and listen to the scientist in the hope that he may make some contribution to their own field. Without their appreciation of my efforts and their enthusiastic encouragement of my work, the present book would never have been written. I am grateful to them, not only for their help but for having so generously opened to me a beautiful and exciting field of study.